This is what took the stress out of my Sunday morning this week. 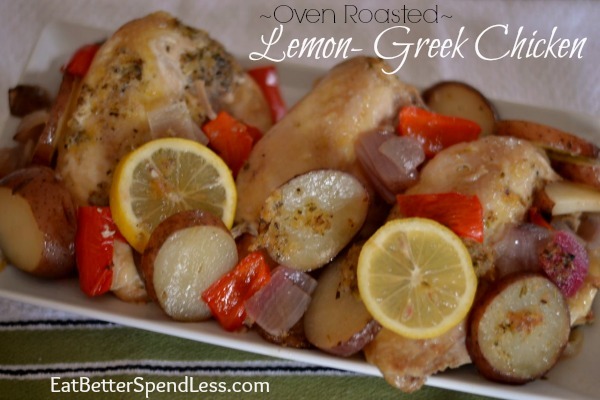 I woke up knowing that this gorgeous Oven Roasted Lemon Greek Chicken was all prepared in the fridge and ready to pop into the oven. No worries about finding something to feed everyone when we returned from church. Ah… such a nice, comforting thought! And a comforting meal too! Great for cold Sunday afternoons. You’ll feel like a rock star homemaker and no one has to know it only took you about 10 minutes to prepare! You could even get away with taking a nap after putting a meal like this on the table! 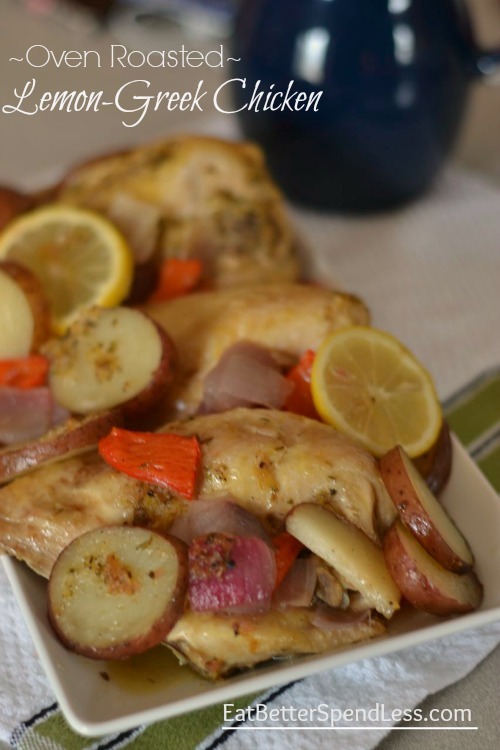 Just don’t tell anyone that all you had to do was chop some potatoes, red pepper and red onion, mix some spices, and put it all in a pan with some chicken! They won’t hear it from me, I promise. I’m thinking about trying this one in the Crock Pot too. I imagine it would be just as yummy, and then you’d have the flexibility of being away from the house longer while it cooks. I’ll put that on my to-do list. Combine zest, juice, oil, garlic, oregano, salt and pepper; mix well. 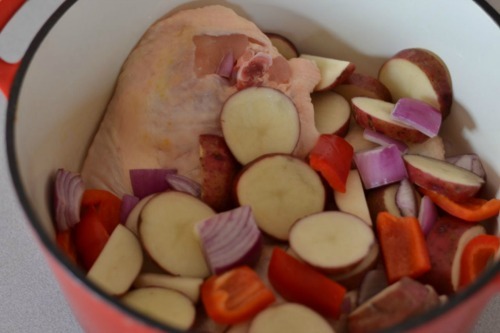 Place chicken in bottom of a roasting pan or dutch oven. Cut potatoes in slices, leaving the skin on but cutting out unattractive spots. Cut bell pepper into 1-inch chunks. Cut onion into 1-inch wedges. Thinly slice remaining lemon. Combine potatoes, bell pepper, onion, and lemon slices with remaining lemon juice mixture and toss to coat. If Sunday lunch is ever a frustration for you and you love the idea of it being mostly ready or all ready when you get home, you need to check out my free e-book that I’m giving away this month. Click the graphic below and it will bring you to a page where you can sign up. Never stress out about Sunday lunch again, and try your hand at freezer cooking! Oh girl, this looks good!!! Adding it to my meal plan. THAT looks delicious and super easy!